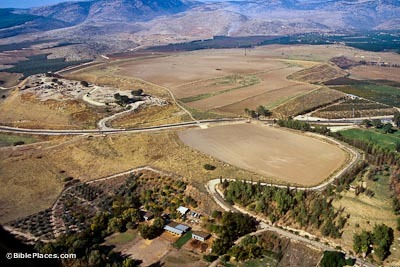 Known in Joshua’s day as “the head of all those kingdoms,” the tell of Hazor is today the largest in Israel at 200 acres. At its height in the Canaanite period, the city encompassed the entire tell. Later when it was inhabited by Israelites, the fortified city included only the Upper City. 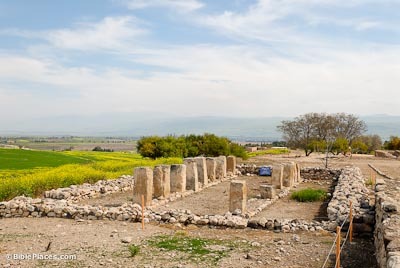 Archaeologists have uncovered a six-chambered gate at Hazor, which is nearly identical in size and design to gates at Megiddo and Gezer. The best explanation for this is that these gates were all built by the same government. These gates are a remarkable testimony to Solomon’s building activity as described in 1 Kings 9:15. A century after Solomon’s time the Israelites built a massive shaft 40 meters deep into the tell, reaching the water table below. The 19 m vertical shaft was about 15 m square and ended at a wide, sloping stepped tunnel that led 25 more meters. This system is similar to those at Megiddo and Gibeon. 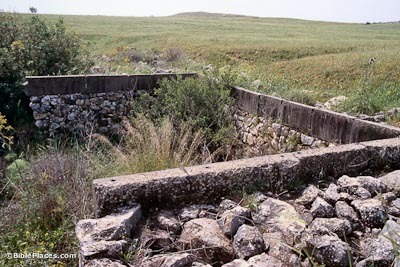 Some of the most impressive remains from Hazor date to the Middle and Late Bronze Ages when the Canaanites lived in the city. Many structures in the Lower City were cultic structures and included religious figurines or standing stones. Some buildings were lined with basalt orthostats. This type of building, better known as an Israelite tripartite pillared building, has been found at numerous sites throughout the country. Many functions for this type of structure have been suggested. Some archaeologists believe that these were used for the storage of food; more likely, the primary function of this building was for housing the royal cavalry. This popular building style would be better known as a “pillared house” than by the number of rooms in it. Found throughout Israel from the time of the settlement of the Israelites, the number of rooms in the dwelling may vary, but always it is characterized by a row or two of pillars separating the central court from the side room. 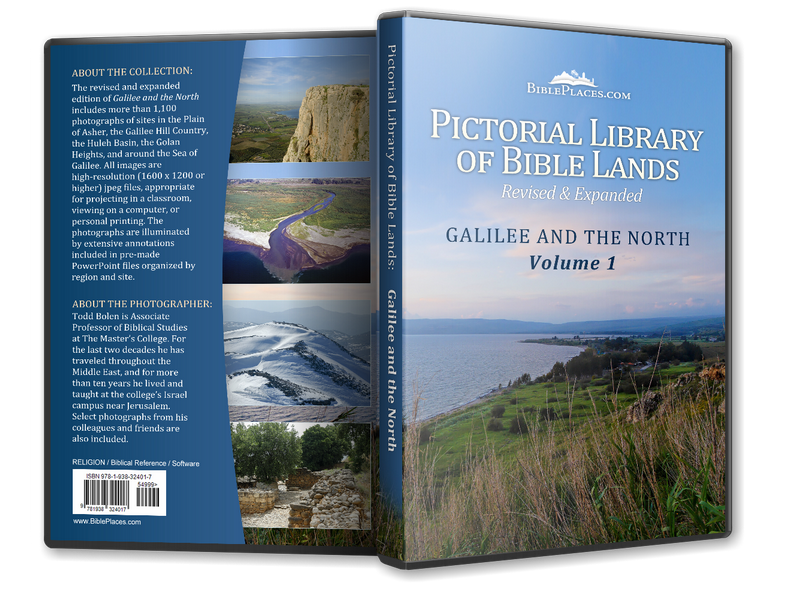 Download all of our Galilee and the North photos! Tel Hazor Excavation Project The official site for the Hazor Excavations. Contains information for those interested in joining the dig. History of the site, excavation reports from previous seasons, and pictures are also included. Hatzor: “The Head of all those Kingdoms” (Jewish Virtual Library) Highlights Hazor’s history during the periods of the Canaanite city and the Israelite city. 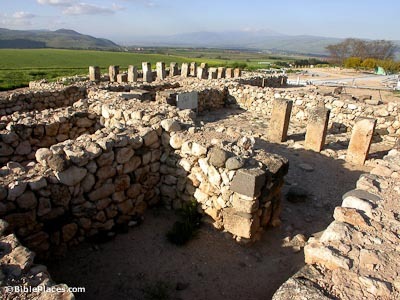 Hazor (Walking in Their Sandals) Gives easy-to-read information on the location, biblical significance, etc. Features links to photographs and on-line scripture references. 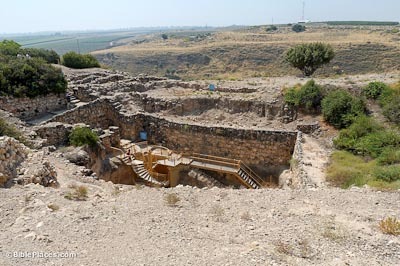 Hazor (ChristianAnswers.net) Offers the reader a brief first-hand account of an archaeological dig in Hazor. Features pictures that illustrate and enhance the text. Tel Hazor Tablets (Crystalinks) Lists many important facts about the site “bullet-style.” Includes a picture of the tablets. Recent Archaeological Discoveries at Hazor (Laramie County Community College, Cheyenne, WY) Reviews history of the site as uncovered by the first excavations and discusses findings from the renewed excavations beginning in 1990. 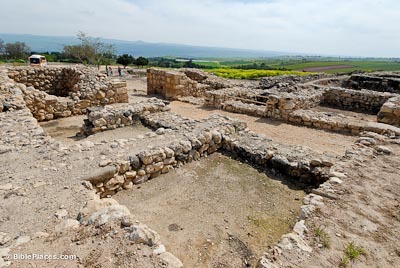 The City Of Hazor And Old Testament Accuracy (ChristianCourier.com) An article demonstrating one example of harmony between archaeology and the text of the Old Testament. Hazor (Virtual Travels, Personal Israel Diary) A traveler draws lessons from his experiences. Several pictures of fair quality.